I'm trying to catch you guys up on the house projects we've done over the past year - and we're almost to present day with the kitchen! The last tweak we did was to swap out our dark and dated hardware for brushed nickel knobs. 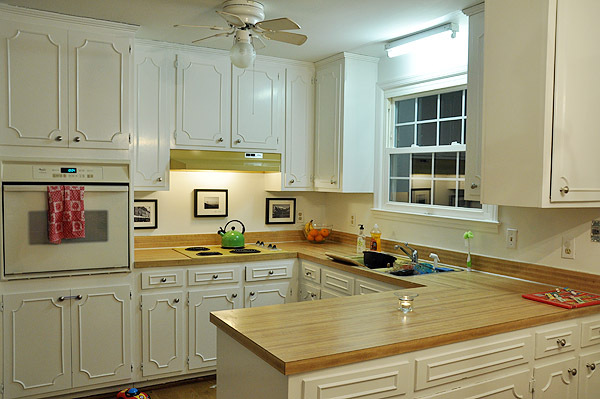 I think they really make the space look more streamlined, and the contrast between the knobs and white cabinets is much less stark now. I picked up the knobs at Lowe's - check them out here. I mentioned in an earlier post that we removed that panel over the window. Now the not-so-attractive fluorescent light is exposed, but that will be replaced with a pendant as soon as we can decide on one! Be sure to take a look at those rad linoleum floors in the before photo! 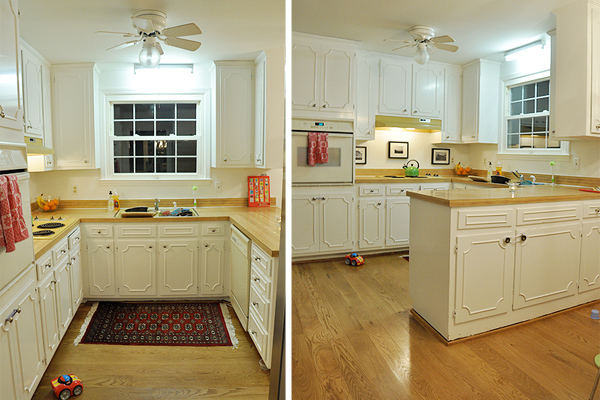 Just ignore the glaring old knobs on the right photo (very front cabinets)! 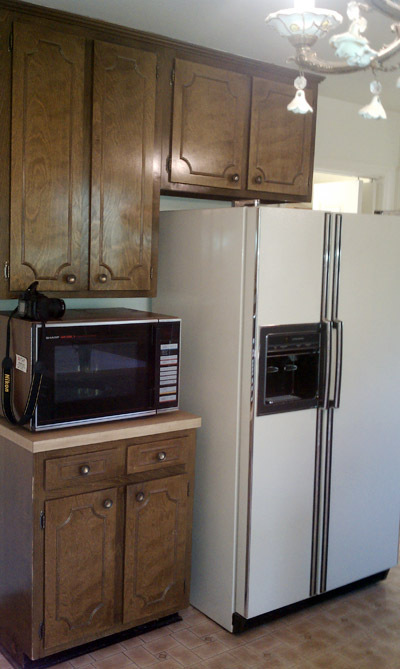 Those doors are faux, and we will have to pull our dishwasher out from the other side before we can swap out the knobs! We also replaced our refrigerator, strictly out of necessity. When we got home from our beach vacation last September, the old (possibly 30-year-old?!) fridge had leaked everywhere. The ice maker was totally kaput, and our home warranty didn't cover the repair. 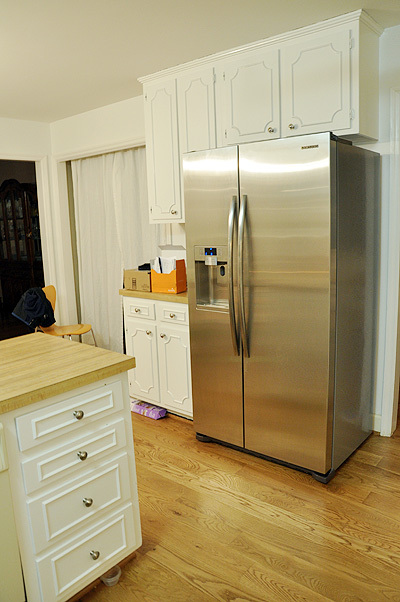 So rather than risk more leakage all over our brand new hardwood floors (more on those here), we decided to bite the bullet and get a shiny new refrigerator. As much as I loved our harvest gold 70s model fridge (can you hear my sarcasm through the computer? ), I was pretty excited to have an excuse to shop for a stainless steel modern-day version. Because our refrigerator is located in a walkway into the cooking area, we opted for a counter-depth model. It doesn't stick out nearly as far as the original, so we lost a bit of storage capacity, but the inside is organized so well that we have never missed the extra space. And we have a spare fridge in the basement for overflow (it's usually just stocked with beer! ), so we weren't too worried. 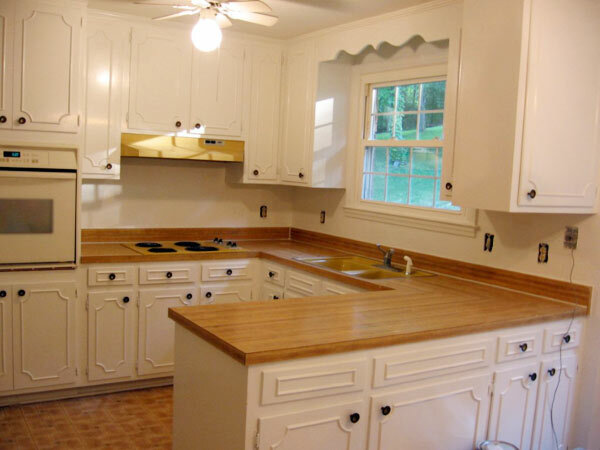 I have a long list of kitchen wishes, the first of those being to replace ALL of our harvest gold appliances. I have a long term plan in mind, so we will update a few things here and there as we can afford it, and then in a few years will hopefully be able to deal with the major components like the counter tops, back splash, and maybe swapping out the upper cabinets for open shelving.